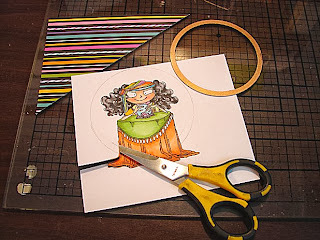 to enter it in this weeks Kraftin' Kimmie Blog Challenge. The challenge was to use embellishments. I tend to do clean and simple designs but it was fun to dress this one up a bit. 1. the die goes cutting edge down on the image. 2. lightly draw around the outside circle edge. 3. mark the inside circle edge beside the part of the image you want to hang outside the circle. and lift the part you cut out so that its over top the metal circle. I've done this wrong a bunch of times, so often I'll cut it out before I send a lot of time coloring!! 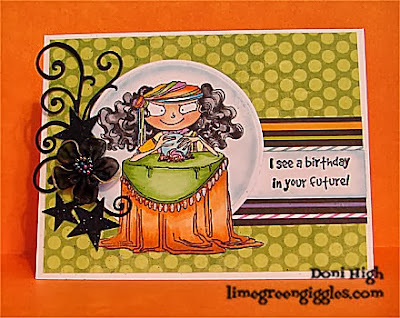 Awesome card, I love the black embellies you used, they really pop!! Thanks so much for playing along with us at Kraftin' Kimmie Stamps.